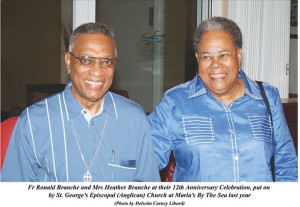 After guiding the St George’s Episcopal Anglican Church for 13 years, Father Ronald Branche will be leaving the Territory for Trinidad. Father Branche arrived in the BVI in 2002, and from that time to now, he served not only the church, but the wider community in many ways. His tenure at the church’s rector is highlighted with many projects, developments and accomplishments, but Father Branche is accepting little of the credit. “Yes it comes down to the leader, but if I didn’t have the cooperation of the people it wouldn’t have happened, so I thank God for the good synergy,” he added. As he prepares to leave, the Church Leader said that his successor will have to take some time to understand, and learn from and about his environment. Most of all he said the incoming Reverend will need to pull from his experience. “It took me a little while,” he disclosed as he referred to his arrival time as the honeymoon period. Father Branche described the rebuilding of the church as one of high points of his time at St George’s. He spoke affectionately of the Church’s education pursuits: “The schools are in good hands. We should move from strength to strength.” He spoke fondly of the secondary school as he said: “That is the school that I assisted to introduce in 2004.” He confirmed that the school is growing and achieving much. “Throughout our graduation period the children have done well,” Father Branche stated before noting that many past students have completed their first degrees, and returned home, while others are going on to their second degree. Nevertheless, one of the unfinished projects was the attempt by the BVI Christian Council to have a code of conduct/ethics during elections. He said that the process begun but was stalled during the 2003 elections and due to a break in communication between the Council and political entities nothing became of the proposal. “Obesity is another thing — too many of our children are overweight and that is going to be a health problem down the road…These are matters that we can’t sleep on or they will become bigger problems,” he added. The St George’s congregation organized various events to demonstrate appreciation to Mr. and Mrs. Branche. The first was a concert/social evening that was held on 13 September. That event will be followed by a banquet on 19 September and a special service featuring the Rt Rev. E Ambrose Gumbs on 20 September.